Leaders from across New England and the Maritime Provinces will come together to understand how the Gulf of Maine is expected to change in the next 30 years, build a shared vision for regional resilience, identify steps to achieve that vision, and activate new collaborations for action. 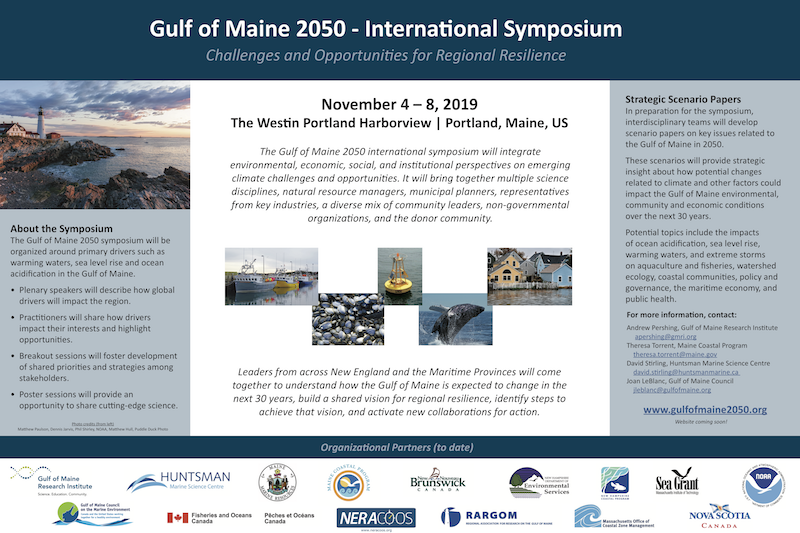 The Gulf of Maine 2050 symposium will be organized around primary drivers such as warming waters, sea level rise and ocean acidification in the Gulf of Maine. Plenary speakers will describe how global drivers will impact the region. Practitioners will share how drivers impact their interests and highlight opportunities. Breakout sessions will foster development of shared priorities and strategies among stakeholders. Poster sessions will provide an opportunity to share cutting-edge science. Event registration will be available in early 2019.